In 2014 we did an article on digiscoping using our Vanguard spotting scope. Three years later we have found a different, easier, technique that also works in more situations. 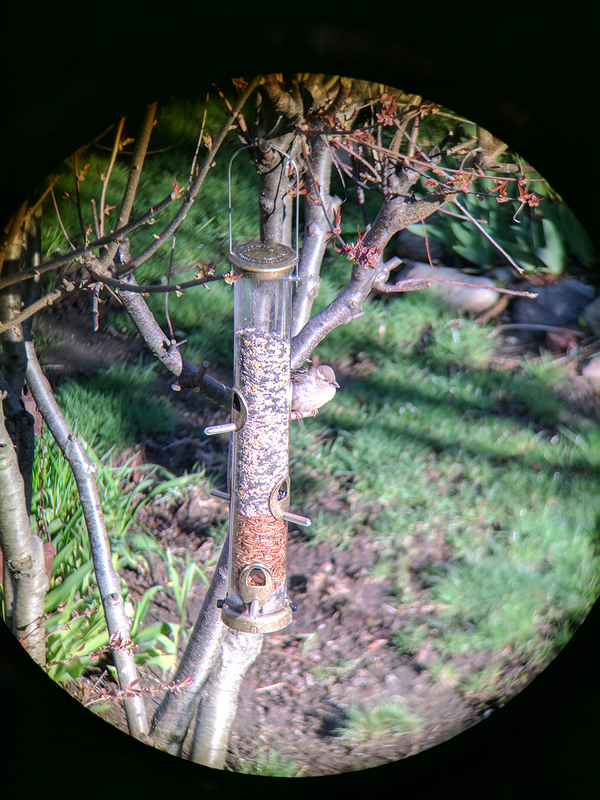 Afocal photography, or taking the photo through the eyepieces of a pair of binoculars, is the same, but the new gear makes it much quicker to set up, easier to get the shot, and a lot more portable. The photo above was taken with a regular point-and-shoot camera, to serve as a frame of reference for some of the photos taken using the afocal technique (below). One way to take afocal images is to put the smartphone over one of the eyepieces of a pair of binoculars and snap away. It is quick and sometimes provides a passable image, but more likely than not it will be blurry and poorly framed. The problem is, having to hold both the lens AND the camera steady, aligned to each other, while framing the subject of the shot, and then snapping the pic. How to solve the problem? 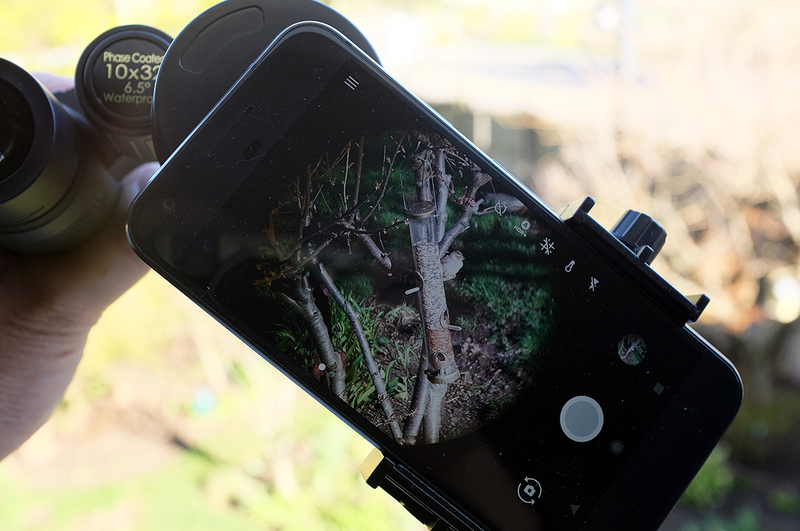 Align the smartphone’s camera precisely to the eyepiece using a mount, and use what the image on the smartphone to frame the subject in real-time: easy-peasy! This is the afocal mount we are using for our BinocCam setup. 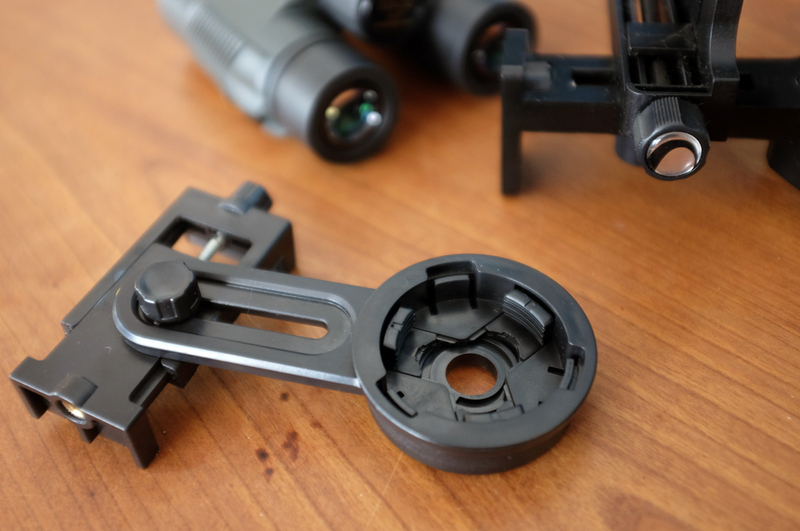 The mount is made mostly of resin plastic, and comes with an adjustable circular clamp for sizing to various eyepiece diameters, a slide to align the camera/eyepiece, and a flat clamp for holding different size smartphones. 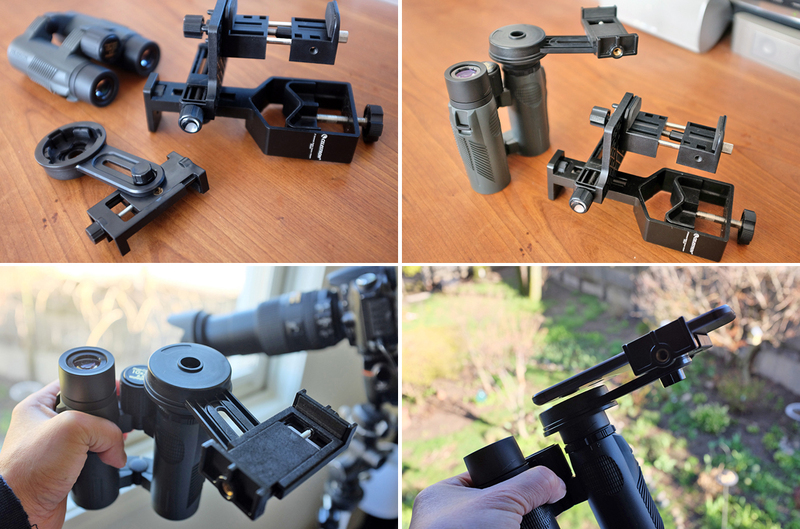 We have looked at a few other mounts, and while some are more flexible, we found them to be too bulky for use with binoculars. This style of adapter/mount should work for binoculars, spotting scopes, telescope, and even microscopes… basically anything with an eyepiece. The best part? One of these bad boys can be had on Amazon for around $10 or for half that on EBay WITH shipping…direct from China in a week!!! To frame the shot, we use the image on the screen of the smartphone. Below is a photo taken with the Pixel Google phone. The outline of the lens of the smartphone’s camera and how it was aligned with the eyepiece of the binoculars can be clearly seen. 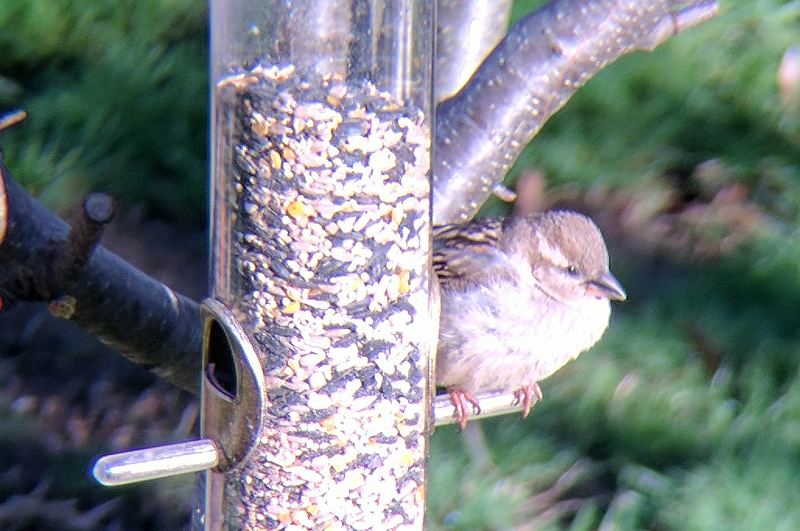 The shot above was taken with a smartphone, handheld, from 25 yards away, through the eyepiece of a pair of binoculars. 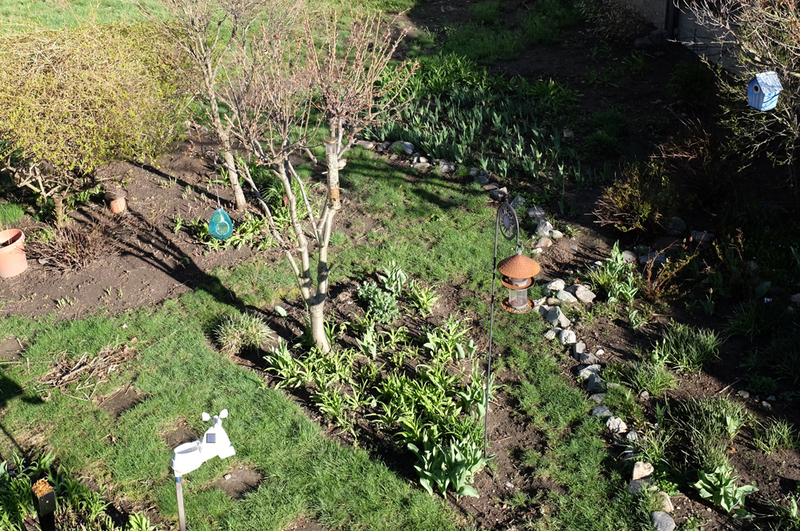 A photo of a sparrow on a bird feeder is not remarkable in any way. What IS remarkable is the detail in the photo. Below is the same image taken with the Pixel Google smartphone but cropped at 100% resolution. The fact that we can see the claw is nothing less than amazing!!! The BinocCam will definitely change how we outfit ourselves on our future Urban Safari adventures! We hope it will enable us to bring back some hard-to-get images to share with our readers. Hopefully we’ll have a gallery of interesting shots by the end of the Summer!!! The Best Smartphone on the Planet?